In ADHD, an area of low understanding and empathy, Shire embraced their brave values and developed an emotive, interactive experience to immerse internal stakeholders in the journey of a child with ADHD and build awareness of what it’s really like to live with the disorder. Using insights gathered from pan-European ethnographic research into the everyday lives of caregivers of children with ADHD, a series of rooms were constructed to form an experiential maze in the Shire headquarters. Each room of the maze was designed to help participants experience every stage of a child’s journey with ADHD, through the eyes of a caregiver. 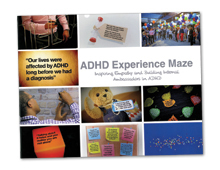 Throughout the course of European ADHD Awareness Week, Shire colleagues were invited to explore the maze and experience the same challenges and emotions faced by people with ADHD. After taking the journey, they emerged into a large classroom in the middle of the maze, where on one day a ‘Real Perspectives’ lunch and learn session was held with a multidisciplinary expert panel to provide a complete picture of the realities of ADHD. The maze was attended by more than 220 visitors (85% of employees onsite) and 100% of participants stated they had an increased understanding of the disorder. This was a very effective and experiential way of delivering internal education and helping staff to empathise with a difficult to understand disease.